In Europe in the early 1700s, the social status of beer and wine drinkers was evidenced in the materials from which their drinking vessels were made. This had been going on for the hundreds of years of the medieval period. The royals, nobles and very wealthy used silver or imported Chinese porcelain. The merchant class used pewter and some rough forms of decorated stoneware. The peasant class used and re-used pewter and crude undecorated stoneware, or carved out wood for their beer drinking containers. Anyone who did not have one, might have had a dream of owning a silver beer stein (the English call them covered tankards) to grace his fireplace mantle. The discovery of the fused (rolled) plating process by Thomas Boulsover in 1750 allowed many of the rising middle class to achieve a semblance of their dream. They could purchase articles made of what we now call “Old – Sheffield Plate” for the cost of approximately one-fourth of their “sterling” or .800 silver counterparts. Mr. Boulsover went on to a highly successful career making saws and other edged tools, leaving others to further develop his invention. The process was simple: Bind an ingot of silver with a larger ingot of copper, heat it in a furnace until it wept (fused). Then, take the newly created fused ingot and process it to the desired thickness by sending it through a series of rollers to compress, hence the name rolled. The silver-copper sheet was then hand-tooled almost exactly as the much desired sterling items were, but at a much lower cost. Prior to Thomas’ discovery, plating was accomplished using either a method known as French plating, which involved the use of a heated silver foil applied by hammer to a heated surface, or by close plating, which used tin as a flux under the silver foil. There was also vermeil, which was plating in gold, usually over silver, and using mercury as a processor. The new process was quickly accepted and stormed England and the continent where fused plated drinking vessels were made for about the next one hundred years. with a larger dose of antimony. It was not so much a new material as it was a new process. The steins and other products using this metal were spun, simply by hammering a sheet of metal around a mold which was attached and spinning on a lathe. This mode of power was of course the result of the industrial revolution and was a dramatic step beyond the pouring of pewter into molds and soldering the parts together to make a beer stein. Spun Britannia ware was so shiny, durable and such a rage that it caused the Sheffield platers to reduce the proportion of silver used in the final ingot in order to reduce costs. Therefore, the fused plate produced in the British Isles and on the continent was much thinner between 1820 and 1850. But it was all for naught because in 1840 in the town of Birmingham, England, two industrious brothers named Elkington were fooling around with silver nitrate in a solution with charged electrodes. They invented and refined the electro-plating process and, as they say, the rest is history! Within ten to fifteen years their patented secret was known and – manufacturing plants were being established in France, Germany and of course the U.S.A. It drove the pewterers, and the Sheffield platers, completely out of the home goods market by 1880. Only some of the pewterers specializing in Art Nouveau were able to stay in business to the century’s close. LEFT: A WOOD AND SILVER PLATED STEIN MADE BY THE ST. LOUIS SILVER COMPANY, DATED 1904. MIDDLE: A “WMF,” GERMANY SILVER PLATED ART DECO STEIN WITH A REMOVABLE FACETED GLASS INSERT MADE BY THAT FACTORY’S GLASS SHOP (HÜTTE.) SO IF SOMEONE BROKE THE INSERT THEY WOULD BE ABLE TO ORDER A REPLACEMENT AND NOT HAVE TO BUY ANOTHER STEIN. RIGHT: ANOTHER “WMF” GLASS AND SILVER-PLATE STEIN. THIS ONE’S STYLE IS CALLED ART NOUVEAU. IT HAS THE GLASS INSERT HELD SECURELY TO THE STEIN BY A METAL RING IN THE BOTTOM . THIS IS A QUITE ATTRACTIVE AND VERY SOUGHT AFTER STEIN. One may have noticed that I did not say anything about the “Britannia” manufacturers in the sentence above. They were excluded because it was soon found that Britannia metal with its silver color was a better base metal than copper for electro-plated vessels. When the silver wore off, the surface underneath was still silver-colored rather than revealing a darker color as would be the case with steins using copper as a base. It is interesting to note that original Elkington silver-plated drinking vessels are extremely collectible. In October of 1985, an Elkington-made beer serving jug sold for $8103 at Sotheby’s. The same year a 1500s German silver-gilt beer stein only realized $4920. [L] A Meriden Britannia Company (USA) stein, but with a finial of Gambrinus, who was the German king of beer. See tab this web site. [R] A plated but unmarked continental stein with hunting trophies mounted all around the body. In the U.S.A., all types of electroplated wares were in demand. 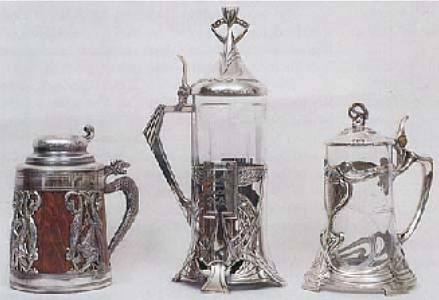 Lidded tankards (what we call steins) were primarily made for the German-American communities, but they usually demonstrated high-quality design and conformed to existing European standards. The largest American manufacturer, The Meriden Britannia Company (later to become one of the principals in the International Silver Company), produced a large variety of silver-plated drinking vessels. The wording quadruple plate on the impressed base mark was assurance of top quality and meant the stein produced had been through the electro-plating process four times. The purpose of passing an object through silver plating four times was to assure that all areas were covered with silver. However, this did not mean that the piece had the equivalent of four layers of pure silver over the base metal.